Although the act usually comes from kind-heartedness or lack of education, feeding wildlife is more harmful than beneficial. From bears to foxes to squirrels, animals have been making recent headlines panhandling for easy snacks. There are many reasons why one should refrain from feeding wildlife, a few of which we will cover. 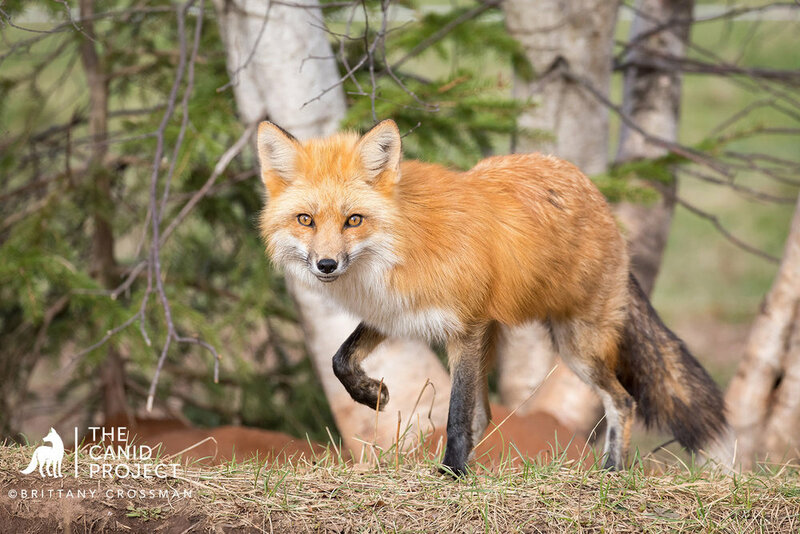 Whereas The Canid Project focuses on members of the canid family, this is primarily based on the red fox, although many other species are in the limelight of this topic as well. So what is the big deal? They aren’t. They are very capable of feeding themselves without help. What these animals are doing is taking advantage of an easy meal in which they do not need. Making wildlife dependant on generosity only hurts them in the long run. Most people act in the moment, without thinking about long-term consequences their actions may have. Not to mention human food typically isn’t healthy for wildlife either, decreasing consumption of proper nutrients, which then can lead to health problems or disease. A common trend also seems to be feeding wildlife from vehicles, throwing food out the window. Feeding foxes from cars does nothing but endanger them. Red foxes begin to associate vehicles as a moving refrigerators, ultimately losing their fear of them. As a result, they will begin approaching oncoming traffic. 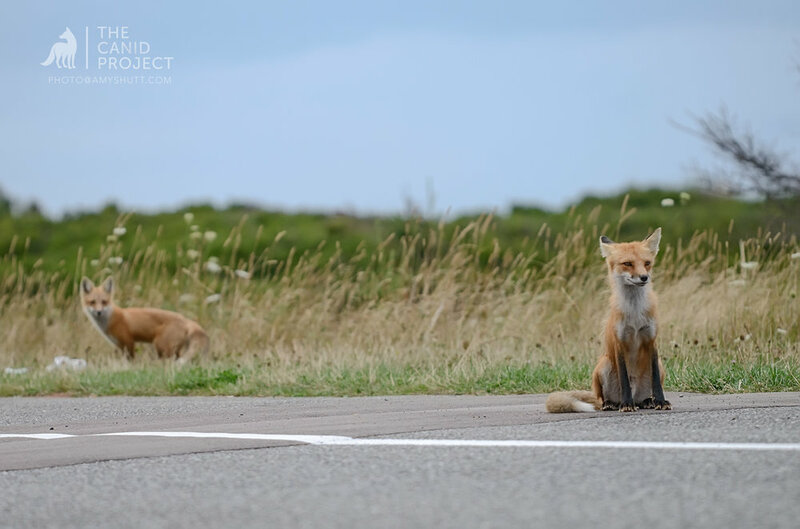 Modifying fox behaviour by conditioning them to approach vehicles for food, can cause accidents, if people swerve to avoid hitting them, or cause unnecessary injury to the animals. Not every traveler will share the same response as you, not everyone cares about wildlife. Unfortunately, red foxes fed from cars usually end up losing their lives to vehicle collisions. FEEDING FOXES FROM CARS IS DANGEROUS BUSINESS. MANY RED FOXES LOSE THEIR LIVES TO VEHICLE COLLISIONS. IN SOME AREAS IT IS THE #1 CAUSE OF MORTALITY. 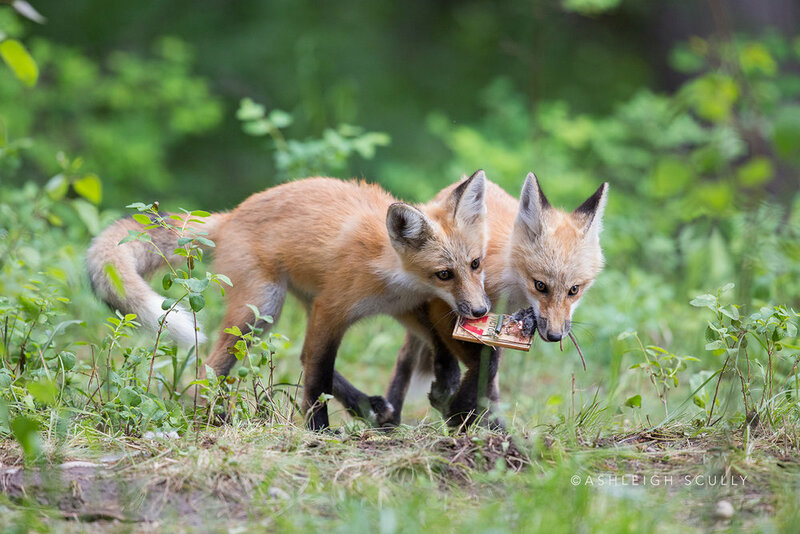 PANHANDLING IS A DANGEROUS WAY TO MAKE A LIVING FOR FOXES AND OTHER WILDLIFE IN NATIONAL PARKS. (THIS PHOTO WAS TAKEN IN PRINCE EDWARD ISLAND NATIONAL PARK). 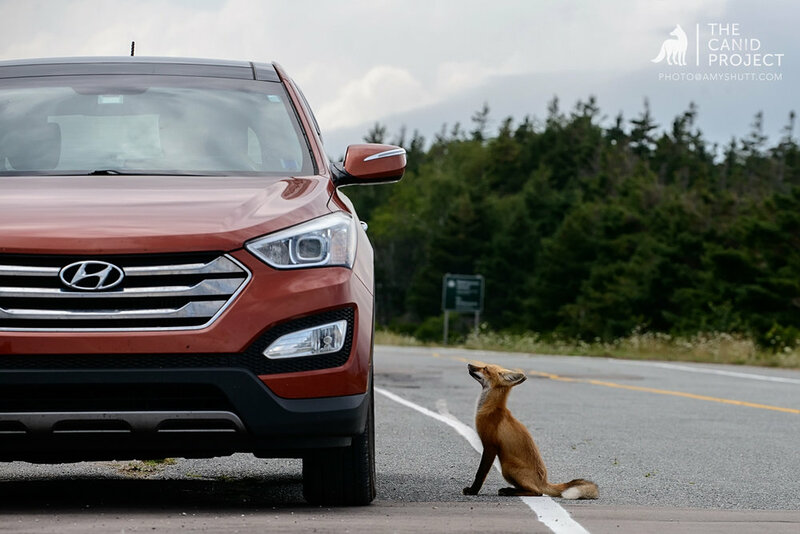 A FATHER FOX PANHANDLES ON THE SIDE OF THE ROAD FOR FOOD, AS HIS YOUNG KIT WATCHES AND LEARNS. PANHANDLING IS A DANGEROUS WAY TO MAKE A LIVING FOR FOXES AND OTHER WILDLIFE IN NATIONAL PARKS. (THIS PHOTO WAS TAKEN IN PRINCE EDWARD ISLAND NATIONAL PARK). “I just wanted to get a photo”. Your best photo ops will definitely not be of a fox chowing down on Doritos, cookies, or bread. As a wildlife photographer, I understand striving to capture that perfect moment. The best advice for this is simply to be patient, besides, capturing natural moments is far more rewarding. If you give wildlife their space, be respectful by not making them feel threatened, eventually they will carry on with their business like you are not even there. Wildlife doesn’t need to be fed in order obtain images of intimate moments. If anything, feeding wildlife will ruin your photographic opportunities. They will fill up on “junk food” and you will undoubtedly miss out on shooting natural behaviours such as hunting, playing, and interactions among one another. Some species self-regulate their populations based on food accessibility. The red fox is one of them. This means, fertility rates and birth rates are based on how much food is around. When plentiful, some species give birth to more kits. When humans interfere by creating a temporary false sense of abundance, especially during the tourist season, it offsets this balance. Leaving garbage out, leftover food, or purposely feeding wildlife creates an artificial food supply. After the tourist season is over, everyone packs up and leaves, there is no longer that leftover food or garbage to scavenge. If there isn’t a natural abundance of prey or food, this causes competition for resources and inevitably injury, starvation, and worst case death. A FATHER FOX AND HIS KIT LOOK FOR HAND OUTS NEXT TO A "DO NOT FEED FOXES" SIGN AT A TRAIL HEAD IN PRINCE EDWARD ISLAND NATIONAL PARK. 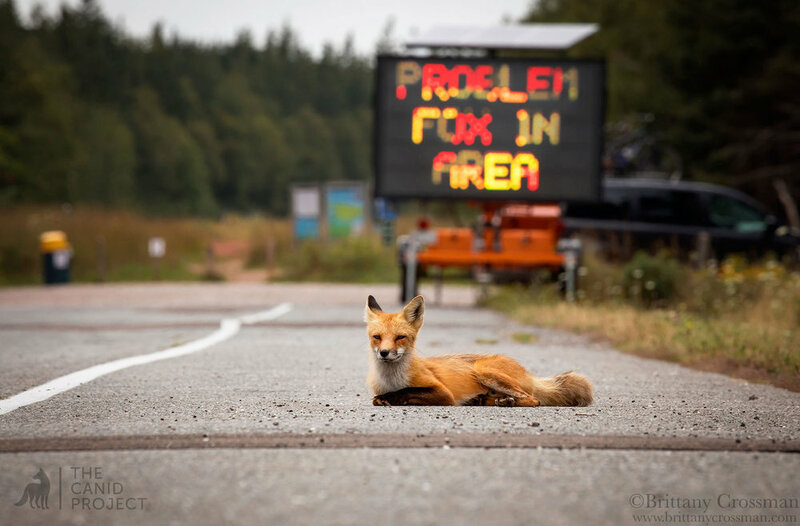 "PROBLEM FOX IN THE AREA"
Human-wildlife conflict is probably one of the more popular issues with feeding. Feeding wild animals teaches that people are food sources, which then causes them to lose their natural fear of humans. Without this fear, wildlife may approach people, coming too close for comfort, hoping for that handout. This behaviour can either irritate or frighten people, leading to complaints, relocation, or euthanasia of the animal deemed problematic. Feeding, especially by hand, amplifies the odds of someone getting bitten. When that occurs, it is almost always the animal that suffers the grim consequences. Putting yourself and the animal at risk for a momentary thrill is just plain irresponsible, and inconsiderate. There are many negative ramifications of feeding wildlife for both humans and the wildlife. We hope that with the right education and community outreach the public will remember these consequences before making the short-sighted decision to offer a free handout. Wildlife can still be enjoyed in backyards and parks without feeding them; it opts for a safer alternative for people and wildlife alike. THE CANID PROJECT contributors actively research and document human-canid relationships and both the positive and negative ramifications of these relationships. The project's aim, as a global creative conversation, is to document and share the stories of humans and the wild canids who enter each other's lives in some capacity. We actively present this information through our photography, creative non-fiction narrative, exhibits, talks, and community outreach to inspire and educate the public, as well as shed light on how these relationships shape our views on the wild canid species. If you would like to donate to this 501c3 non-profit to help further our efforts please click the donation button below, take one of our workshops, or visit our shop! Thank you! BRITTANY CROSSMAN PHOTOGRAPHS SOME OF THE URBAN FOXES FOR THE CANID PROJECT'S ARTICLE SERIES ON COEXISTENCE. With expanding urban sprawl in North America, encounters between wildlife and humans are occurring more frequently. Although habitat loss has reduced wildlife populations, destruction of wild lands is seldom the only reason why certain wildlife has moved into our backyards. 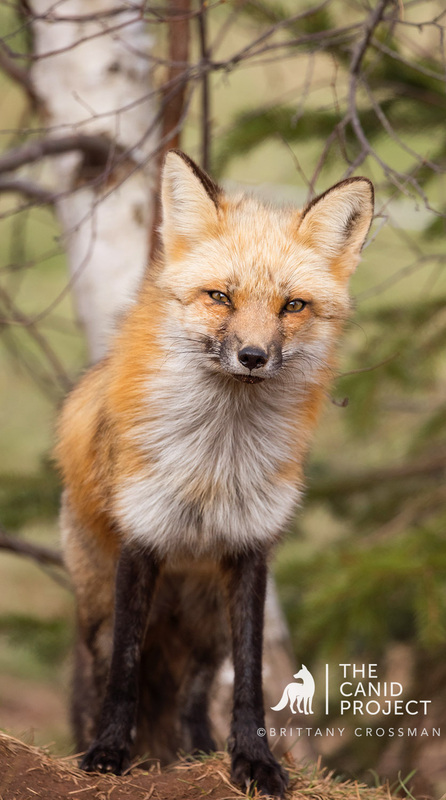 The reasons for the increase in wildlife in many urban areas, and in particular red foxes for the purpose of this article, are more complex than simply wandering displaced animals looking for a new home. We will discuss some, but not all, of these reasons in this article.The scientific study of urban wildlife began only recently, but it’s a fast-growing field. Urban wildlife presents many challenges for wildlife management, while also providing great opportunity for education, outreach, and conservation. At this stage, coexistence seems the only viable solution; and having an educated public embrace this approach is the key to living in harmony. AN URBAN FOX IN CANADA TROTS THROUGH A PARK IN THE CENTER OF TOWN. THE PARK ACTS AS A GREEN SPACE THAT PROVIDES COVER AND DEN SITES FOR URBAN RED FOXES. Some wild animals are labeled ‘synanthropic species’. These species live near humans and directly benefit from human-altered environments like gardens, garbage dumps, and farms. Such areas provide critical resources such as cover (think sheds, under porches, barns), and food (for example, bird feeders, our garbage, the rodents attracted to our garbage, and non-native garden plants that provide fruit year round). Examples of synanthropic species are raccoons, skunks, foxes, coyotes, and certain rodents. These species have learned how to exploit human-created habitats, and they thrive in a mosaic of suburbs and cities next to woodlots and fields, which provides some distance from humans, but also the close proximity that benefits them as well. The red fox is also known as an ‘edge species’, which means they naturally occur at the borders between two habitat types, which is called an 'ecotone'. These ecotones, such as woodlands transitioning into grasslands, offer them different resources that they need to survive, which is why red foxes do not select just woodlands as their habitat. Water sources and corridors, like creeks, are also important in habitat selection. Den sites are usually found within at least 1 to 2 miles of a water source. As we will see below, humans have created habitats very similar (gardens and yards that back up to brushy or densely forested areas as an example) to their natural habitat; our human-modified environments mimic the transition zones of these selected habitats. Why aren't red foxes true forest species and why do they prefer a transitional zone of two habitats? As mentioned earlier, it’s a common misconception that the reason we see an influx of foxes and coyotes in our suburbs and cities is because we have supplanted their woodland homes with our development. Although habitat loss for some species is a real issue that has forced animals from their territories, synanthropic species, like the red fox, are seldom true forest animals by nature, but rather “edge species”. But why? With red foxes it has a lot to do with their primary prey. Red foxes are opportunistic omnivores but they are primarily hunters of rodents, such as mice and voles, which live in grassy fields. In addition, insects, rabbits, hare, and birds also make up their menu; these species tend to favor the shrubby and weedy edges between forest and fields. 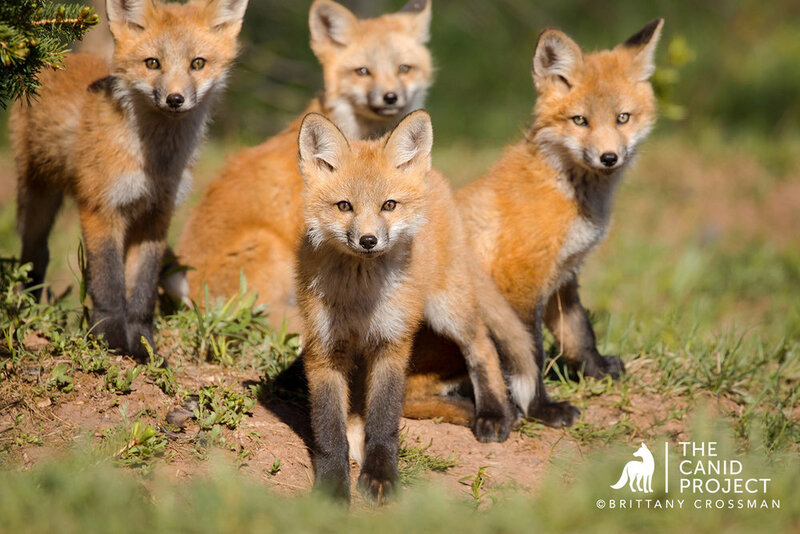 However, red foxes also require cover and den sites that may not be available in open areas. Forests, with dense brush at its edge and hollow logs offer possible den sites and shelter. Therefore, where forest meets grassland is the ideal natural environment for the red fox. Similarly, a neighborhood with human shelters, creeks and ponds, corridors (like a road, railroad or ditches) they can travel to get from one habitat patch to another, lawns, fields of grass meeting the edge of a fragmented forested area or green space, basically provides the same resources that a natural ecocene of forest and grassland provides. And they have an added bonus of even more food resources by staying close to humans: our food waste and the rodents it attracts. So what does all this have to do with why they are in my town? The conclusion is that through our own expansion, city developments, and agricultural practices we have created an induced ecotone that mimics in many ways the natural ecotones where red foxes are found naturally in the wild. Human-modified areas often provide a mosaic of habitats: grass and fields where they can hunt, ditches, parks with trees and fragmented woodlands that provide cover and safety, corridors, and even denning opportunities in our green spaces and sometimes under our sheds and houses (Note: it is thought that Red Foxes may prefer a more natural setting away from high human traffic for dens, unless the lack of resources or green space is high, then they will be more likely to den under/in human infrastructure). And of course as mentioned previously, don't forget that living among humans, or in close proximity to humans, means even more food resources via our trash and the rodents drawn to it. It's no wonder the red fox is drawn to such human-disturbed areas. And, it's no wonder they are here to stay. 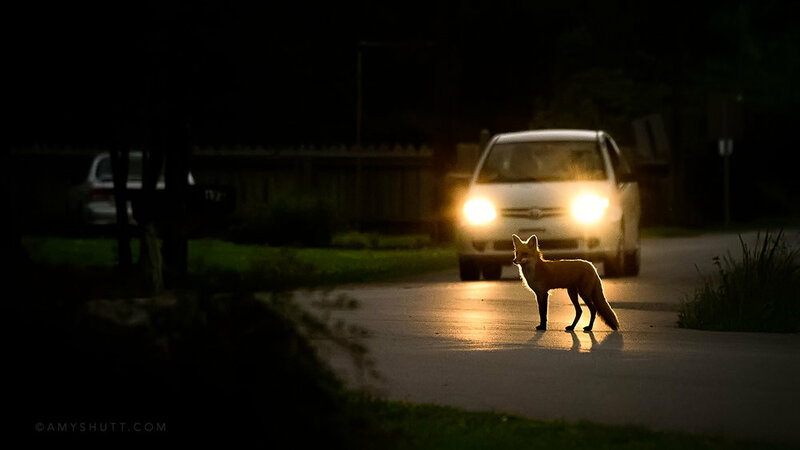 A YOUNG FOX IN CANADA EMERGES AT DUSK IN AN ECOTONAL AREA OF GREEN SPACE AND HUMAN MAINTAINED ROADS AND LOTS. A RED FOX HUNTS IN AN OPEN GRASSY FIELD, WHICH IS PART OF THEIR HABITAT SELECTION DUE TO THE FACT THAT THESE AREAS ARE FAVORED BY THEIR PRIMARY PREY. 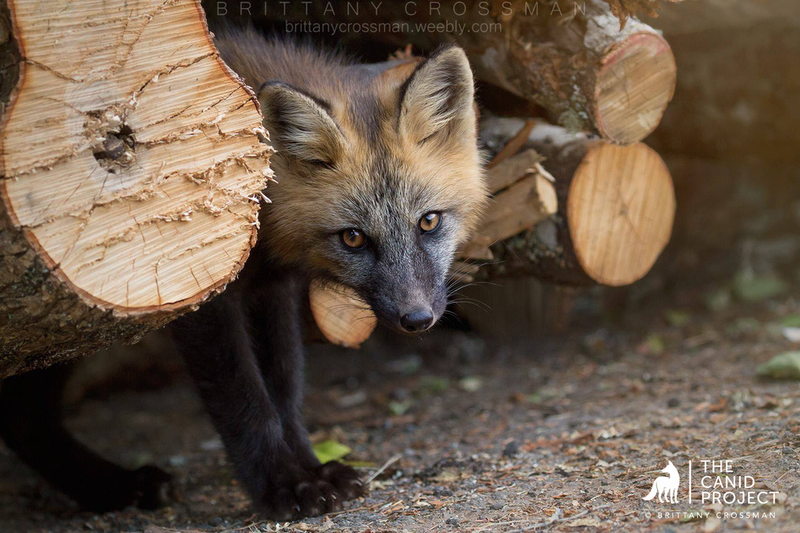 A CROSS FOX KIT PEEKS OUT FROM HIS DEN SITE, A MANMADE WOOD PILE. 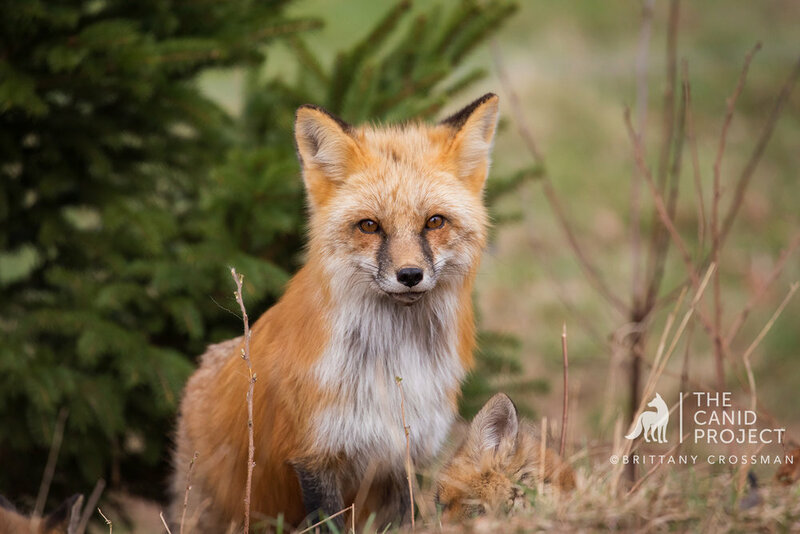 So now that we know why they are here and that they are here to stay, be sure to check back for Article Two of this series: Public Concerns About Red Foxes: Debunking the Myths. 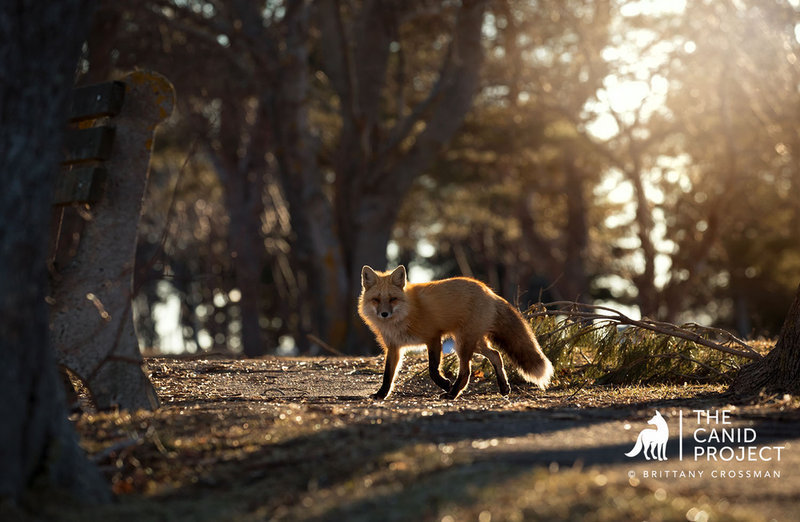 In this upcoming article we will debunk the most common myths, explain the pros of having red foxes in our towns, and take a look at the larger picture so we can understand why we must embrace the idea of coexistence. Over the years I have had the opportunity to photograph many different red fox families. In every situation, I’ve done everything I can to keep myself hidden and reduce any impact that I may have on the foxes. It’s really important to allow the kits to not imprint on humans or prevent the parents from going about their daily routines of hunting and feeding. During these experiences I’ve realized that red foxes have become dependent on many different types of manmade structures, including sometimes the “stuff” around our own homes. These include drainage pipes, porches, sheds, log piles, boulder piles and even outdoor furniture (a woman in our town has a vixen return to her yard each spring to give birth underneath her old picnic table). Why do foxes use these things? I think there are many reasons. First, eastern coyotes are continuing to populate suburban areas and red foxes may be using our backyards as home territories because it makes them feel safe from these larger, competitive canids. Second, the structures available in our yards make good den sites. We have red foxes that use excavated groundhog burrows around our property, but we’ve also seen them use an old boat covered in a tarp, a shed in a local wildlife refuge, and a pipe used to collect stormwater runoff. As a photographer, these “things” may not be attractive to see in photos. Yes, I’ve photographed red foxes on snowy mountains, along flowing creeks and in our hay field hunting meadow voles at sunset, and these opportunities are always exciting and thrilling and make great images. 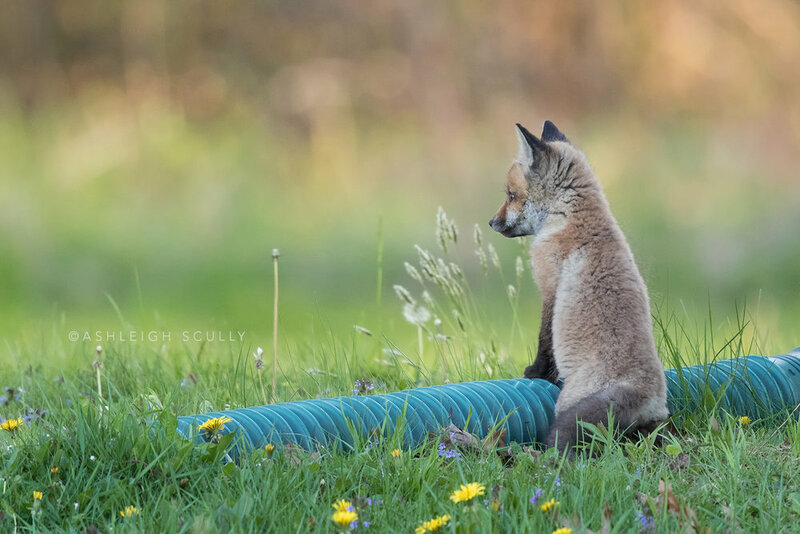 But the photographs of foxes using our “stuff” can be just as powerful. Because foxes in suburban areas in some cases have nowhere else to go. They are boxed in by highways and development and pressured by people and pets. At the same time, we’ve created habitat behind our homes that suits them just fine. At our house, we have had the same male and female denning for at least 5 years, and I see one of them almost every day. We accept them when they steal one of our dog’s toys to give to their kits, or when they sniff around our chicken coop, or when they scream loudly at night during mating season. We decided a long time ago that this is part of the experience of living where we live, and we love it. 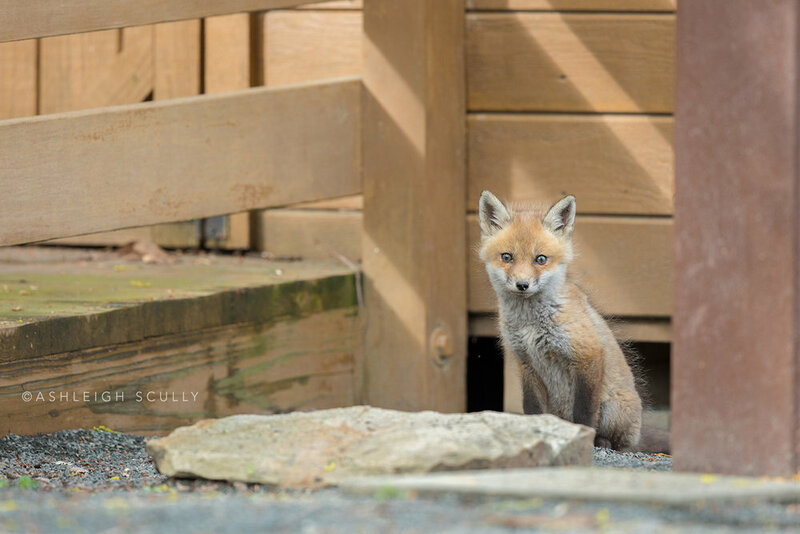 It’s important that we all learn to live with red foxes, and sharing images of them in our yards can tell a story that people can empathize with. This is what all wildlife needs. I’ve never lived a conventional life. Things don’t happen to me in the same way or order they do for most people I know. I didn’t go to college right out of high school and graduate in four years with a degree that would guarantee me a job with benefits and a 401K. The route I chose took me 10 years before I was able to graduate college. I attended three universities and went through three majors before staying put in Philosophy. I had basically given up photography when I switched my major from it to Philosophy. Going to school for photo had unfortunately caused an aversion to the craft. I worked and went to school mostly part-time, but pushed through full-time the past two years. During all this I was also raising my daughter on my own and had been since I was 21 years old . I worked 14 hour days on my online retail business and it was doing fairly well. In the spring of 2007 I was running my business from home and it was doing well enough that I eventually needed more space. After many years of living in a tiny garage apartment I finally had the means to move into a real house. It was still a rental but this was a real house on a lake near the university, and perhaps one of the most picturesque neighborhoods in this city. I chose the house because it was built in the late 1930s and there were heirloom bulbs in the messy cottage garden. I recognized the gladiolus flowers were a variety from the 1940s and the walking irises were just as old, probably passed along from a neighbor. I also chose the house because I could look out the kitchen window and see cormorants, herons and egrets on the lake through early blooming camellias that dotted the long rolling back yard. I’d always lived near water and I was excited to continue the trend for my daughter. Waterways, ponds, and lakes in Louisiana mean birds, turtles, and other fantastic critters-the kinds of things that just feel like home to me. We had been living in the new house a month so far so we were still busy settling in and unpacking. One gorgeous Louisiana spring afternoon as we headed home, I drove into our neighborhood and as I turned the corner only a block from our house my daughter pointed and yelled, “Mom, I just saw a fox!”. I instantly slammed on the breaks and looked back; she was right. There to my left sitting in the drainage ditch between the street and the sidewalk was an adult fox. Her copper fur shown like tiny blazes of fire in the late afternoon light as it filtered through the Live Oak tree canopy above. I backed my car up slowly and stopped when we were eye to eye with her. She just stared at us; she didn’t budge. To this day I think she was the tamest, or boldest, fox I’ve ever come across. I was locking eyes with something that looked and felt so much like a domestic dog, until I noticed her thin vertically oriented pupils. They were more cat-like than canid. At that moment I didn’t know why her pupils were shaped like that, but I saw the wildness of that animal in a way I’ve never seen it in an animal before or since. I couldn’t look away; I was completely transfixed. Later I would learn that the shape of the fox’s pupil and the degree to which they can close down or open them is what allows them to see in dim light; its an important feature since they are largely nocturnal. Not only that, vertically oriented pupils help predators who hunt ambush style, those who hide until they attack their prey from a close distance. The pupil shape allows them to judge distance without moving their head, which for an ambush predator is vital to avoid detection from their prey. We stared each other down for a few more seconds before she very calmly disappeared into the drainage pipe. I quickly drove home to grab my camera. All my film cameras were boxed away so all I kept around was a point and shoot that could fit in a coat pocket. Armed with my tiny camera, I pulled the car up next to the drainage pipe and out popped the adult fox. And then to our surprise out popped a fox kit too! The kit was just as bold as the mom and she looked at us curiously, sniffing the air. We watched them for a couple of minutes then they disappeared into the pipe. I took three snapshots that day. Evening walks soon led us to the den. The fox family was making their home just a few blocks from our home underneath an old uninhabited but maintained house. The house faced the lake and was on a rather busy road, but the foxes largely used the drainage pipes to navigate the area. I remember one morning just after sunrise we drove past the fox house and noticed a small traffic jam caused by the sight of the kits playing rambunctiously outside of their den. As I slowly drove past a man in a truck opposite of me asked, “Can you believe this? Amazing isn’t it?” I smiled and nodded my head. Yes, it was quite an amazing sight. People seemed to really enjoy this little mini-view into the wild on their way to work or school. Taking in the entire scene made me smile, but I remember being a bit concerned for their well-being at the same time. It seems for every one person who welcomes urban wildlife there is another who feels the opposite and who might be capable of trying to have the animal removed and “relocated”. The problem with this is two-fold. Removing and relocating or trapping and killing an animal from an environment just opens up the space for another animal to move in, and if the population is healthy, one will. Both of these options have always seemed pointless to me. Also, animals are territorial. Relocating an animal could dump it into another animal’s territory, immediately causing conflict. About a week after we discovered the den location, my daughter and I sat down at the bottom of the fox house driveway at dusk to watch the fox family emerge from under the house. We sat about 15 feet from each other and kept a good distance from the den entrance. One by one they slowly started to emerge. Mom fox noticed us immediately but kept a distance and just watched us watching her babies, who ran and romped and played and chirped. The bolder kit of the litter soon took notice of my daughter, looking curiously and sniffing the air as he made his way towards her. The others followed soon after. At the time my daughter had long hair down to her waist and she used a fruit-scented shampoo. I wondered if the fruity scents of her freshly washed hair is what drew them to her.. They got closer and closer and eventually their little noses were an inch from her hair and for 20 seconds there was my daughter with a garland of coppery little foxes wrapped around her. The one thought that keep going through my mind was, ‘Why don’t you have a camera with you?’ They eventually lost interest and went back to their romping and running. My daughter was 11 at the time and I know it was an experience she’ll always remember. After that, I remembered to bring my point and shoot with me on our next early evening walk. Keeping distance and watching to make sure I wasn’t making mom fox uncomfortable or nervous, I shot off a few pictures to document the family. The pictures are awful because of the low resolution of the tiny camera and with bad lighting it couldn't correct for, but they are still some of my favorites captured moments. They represent the last time I saw the fox family. Neighborhood talk was that the couple to the left of the fox house had them trapped and removed. I’ll never know if that happened, or if they were run off from the den, but either way we never saw them again. The pictures also represents a very pivotal moment in my life and it’s why I feel I owe so much to the fox. After I took those snapshots that day I uploaded them to an online forum I used to journal and speak to friends on. The first response was from a Russian photographer friend of mine, “Oh these do these creatures no justice. Go and get your cameras out of storage, stop being stubborn, and start shooting again” was the gist of what he typed to me that day. And I remember thinking that he was off the mark because I was just shooting the foxes in a documentary fashion and it didn’t matter. However, I knew deep down it did matter. It mattered in the sense that I gave up something that once gave me great joy and happiness. I gave up the one thing I never got bored with and the one thing I was always hungry to learn more about. It wasn’t just a disservice to the foxes but it was a disservice to myself too. I was being stubborn and getting in my own way. I vowed that day to start shooting again. It meant a lot at the time because I had yet to make the DSLR leap from film. I was a purist and had resisted it for some time. But that day it all became clear, and I started saving up for my first DSLR. Had none of these experiences happened, had I never moved to that house, had I never seen those foxes, I would not be doing what I do today. Photography would not be a part of my life. And yes, I came back to it in a roundabout unconventional way and “late” comparatively speaking, but as I mentioned early on--nothing I do seems to be the result of conventions. I follow my heart more often than my logic, which can sometimes result in a little bit of magic in my life. 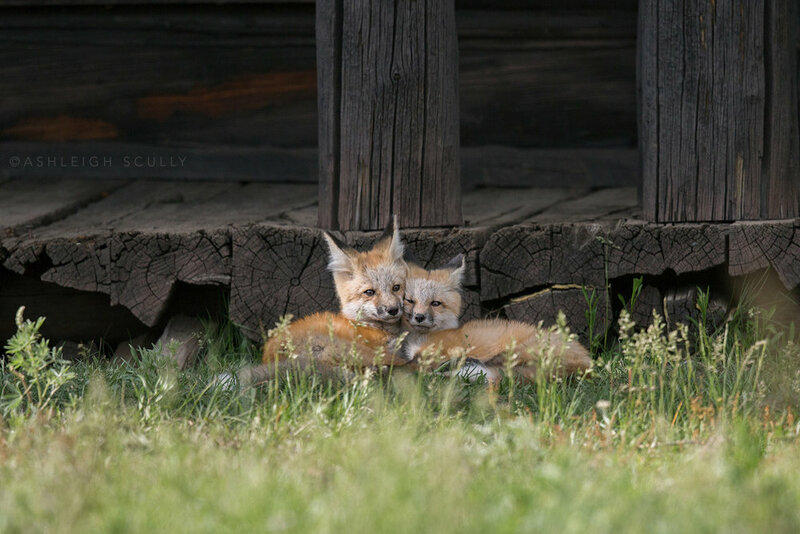 Sometimes when I am with students at a workshop or they tell me how much they have fallen in love with photography or nature having gone through my basic photography class, a little picture of the fox family pops up in my mind. Over the past 4 years, I’ve taught hundreds of students and I wonder if I’d never had the pleasure of meeting the fox family if, photographically speaking, my students would be doing what they are doing today. It makes me think of the term butterfly effect, with reference to chaos theory, which is defined as “the phenomenon whereby a minute localized change in a complex system can have large effects elsewhere”. It’s not exactly the same thing, but taking from the general idea I’ve come to call all of this The Fox Effect. There are undeniable links and connections to foxes in my life and to the people around me. This new photojournalistic project of mine on canids that I’ve been formulating in my mind for almost a year now is a tribute to these inspirational creatures we call foxes and their canid relatives. It is about this effect they have had on my life and those who come into contact with them in some capacity. I hope you follow along.